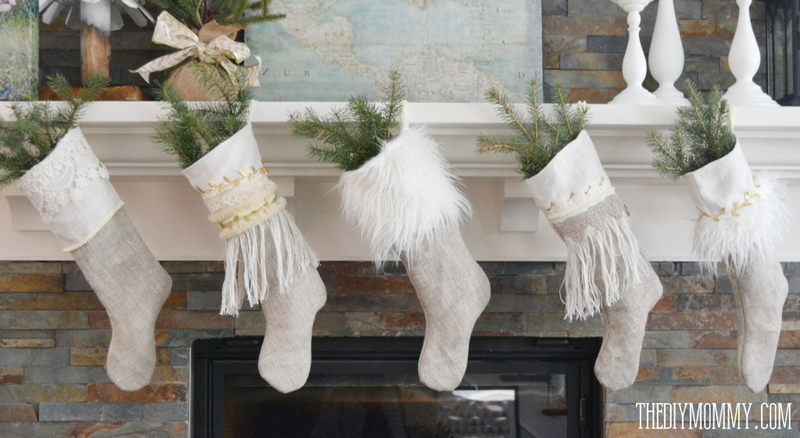 It was time for me to sew some new Christmas stockings for our mantel this year. I thought it would be a good idea to make them neutral in colour so they could match our Christmas decor from year to year, but I still wanted them to be interesting and a little bit fun. 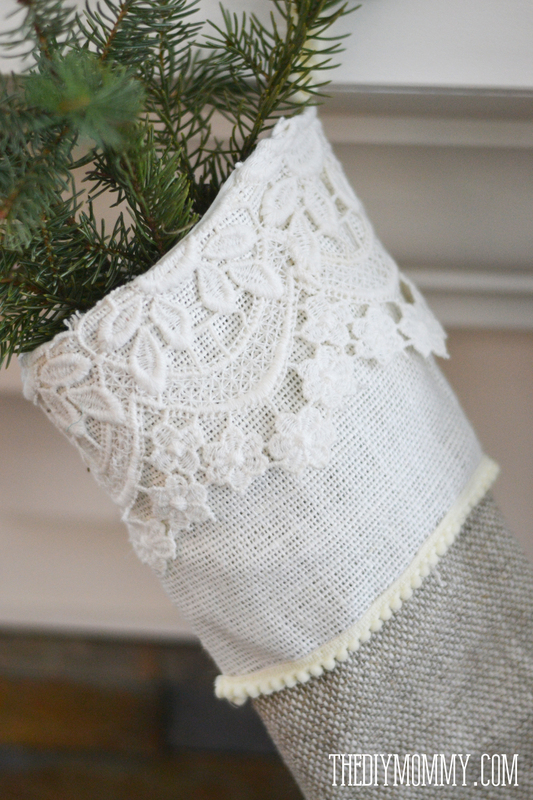 I love linen and burlap, so when I found this gorgeous linen burlap from OnlineFabricStore.net, I knew it would be the perfect fabric for our Christmas stockings. 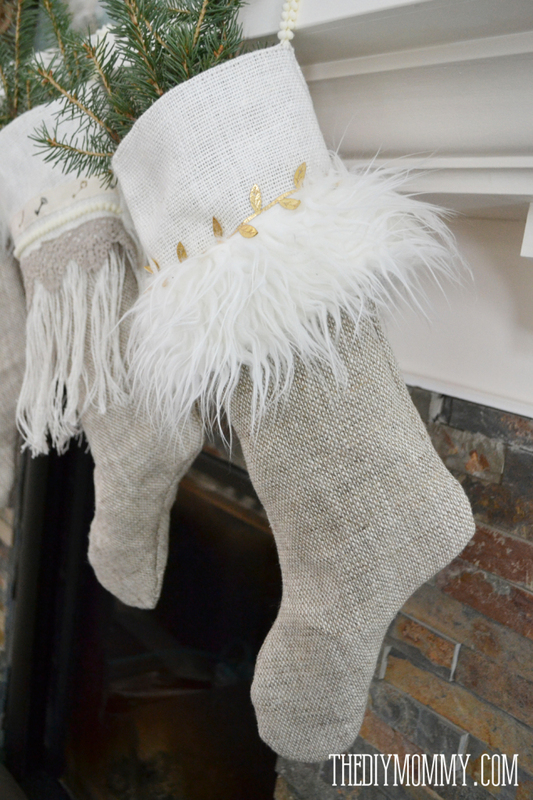 Then, when I saw this stocking from Anthropologie, I had my inspiration to create some pretty new stockings for my family this year. There are five stockings in total that are all made from the same fabric combination, but I’ve made them all slightly different with different cuff and trim treatments. I love the effect! They’re still neutral and classic looking, but the different cuffs make them unique and whimsical. All of the stockings maintain the same colour scheme of ivory, oatmeal and gold, but all of the cuff treatments are completely different. My girls have already claimed the ones with the gold leaf ribbon on them! They’re my favourites too. 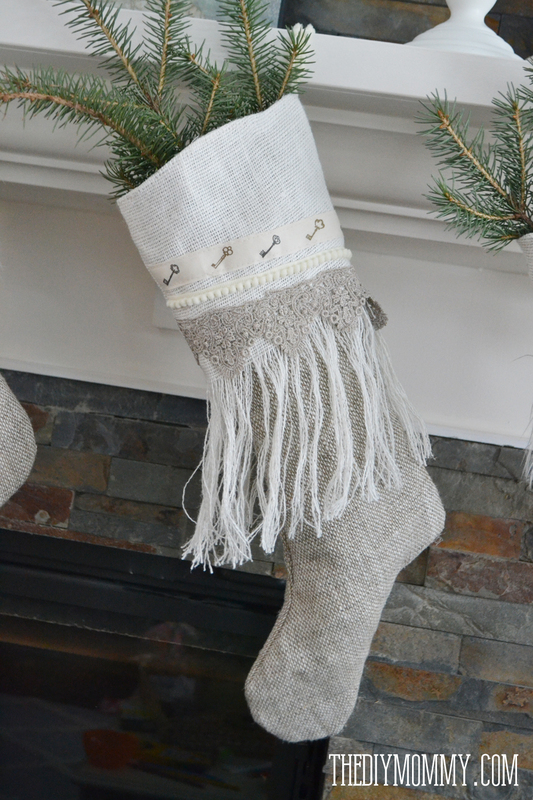 I used irish linen burlap to make these stockings. It’s unlike traditional burlap in that it is much softer and less smelly. It has a gorgeous hand, and I really, really recommend using it! Cut 2 main stocking pieces from the oatmeal linen burlap and two from the lining fabric. Then, cut two cuff pieces (use the longer length shown on the pattern) from the ivory irish linen. There’s no need to cut any cuff linings if you’re making this fringed cuff version. Fringe the cuff pieces from the bottom up to the dotted line on the pattern (about halfway up the cuff). To do this, use a pin to pull out the first crosswise thread on the bottom of the cuff, and pull it out. Repeat and pull out the crosswise threads to create a fringe. Sew the outer stocking pieces together by pinning their right sides together and serging or stitching around the outer edges and leaving the top open. Repeat with the lining pieces. Then, sew the cuff together at the sides. Embellish your cuff piece as you please with pieces of trim, ribbon and lace. Pin the pieces in place, and then sew them down with a machine. Place the cuff inside of the main stocking. 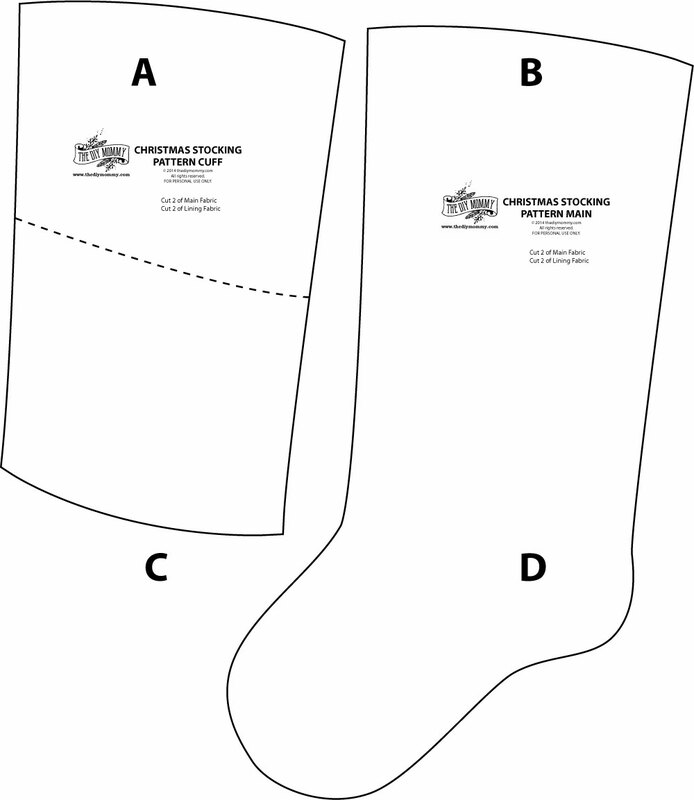 The wrong side of the cuff should face the right side of the stocking. Pin them together, matching the upper raw edge and side seams. 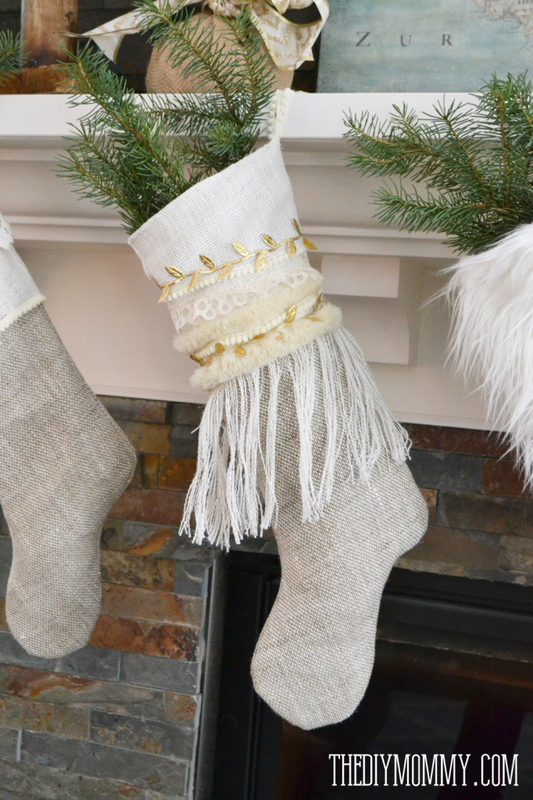 Cut a length of trim or ribbon to make a hanger (mine were about 4″ long), fold it, and pin it to the center back seam of the stocking so that it’s raw edge matches the stocking’s raw edge. Then, pin the lining to the main stocking piece, right sides together, matching the side seams. Make sure the toes are facing the same way! Sew or serge them together, leaving a hole that is at least 4 inches wide. Turn the stocking right side out, pin the hole shut by folding the raw edges inward and then top stitch around the entire top edge of the stocking to close the hole and finish the stocking. Make the cuff half the length (use the dotted line on the pattern to cut), and trim the bottom of the cuff with faux fur and embellish with a gold ribbon. Make the cuff half the length, and trim it with pom-pom trim and vintage lace. 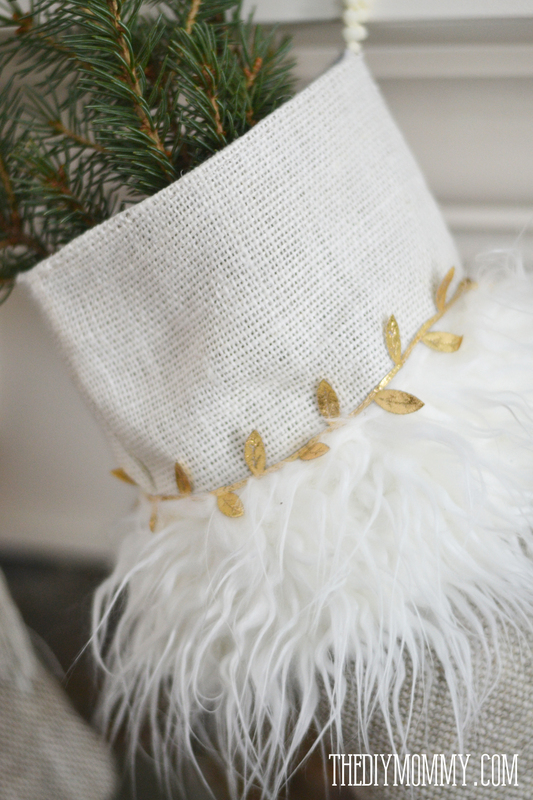 Make a fringed cuff, and embellish with lace, pom-pom trim and cotton patterned ribbon. 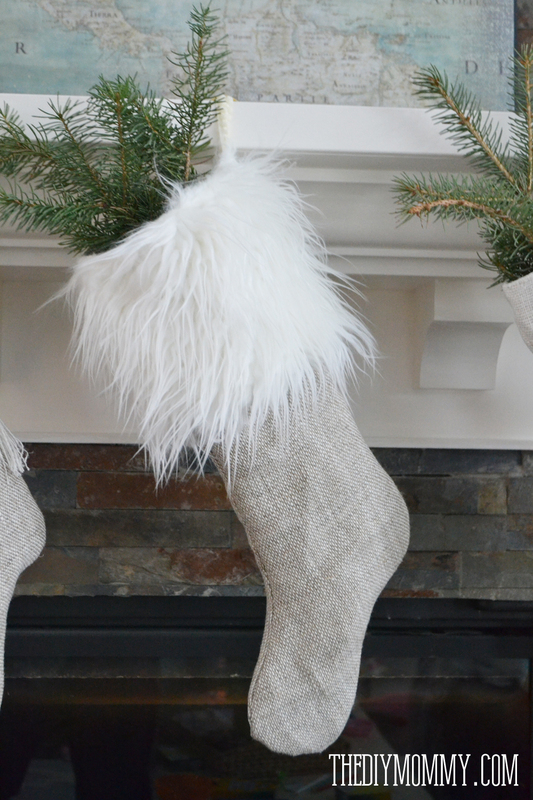 Sew a stocking with a shorter cuff, and make it entirely out of faux fur. For this one I cut cuff pieces from faux fur AND from lining fabric. I sewed the cuff side seams on the fur piece and the lining piece, and then I pinned them right sides together. Then, I sewed the fur cuff to the lining cuff along one long edge. I flipped the cuff to the right side and then continued on with the original directions. 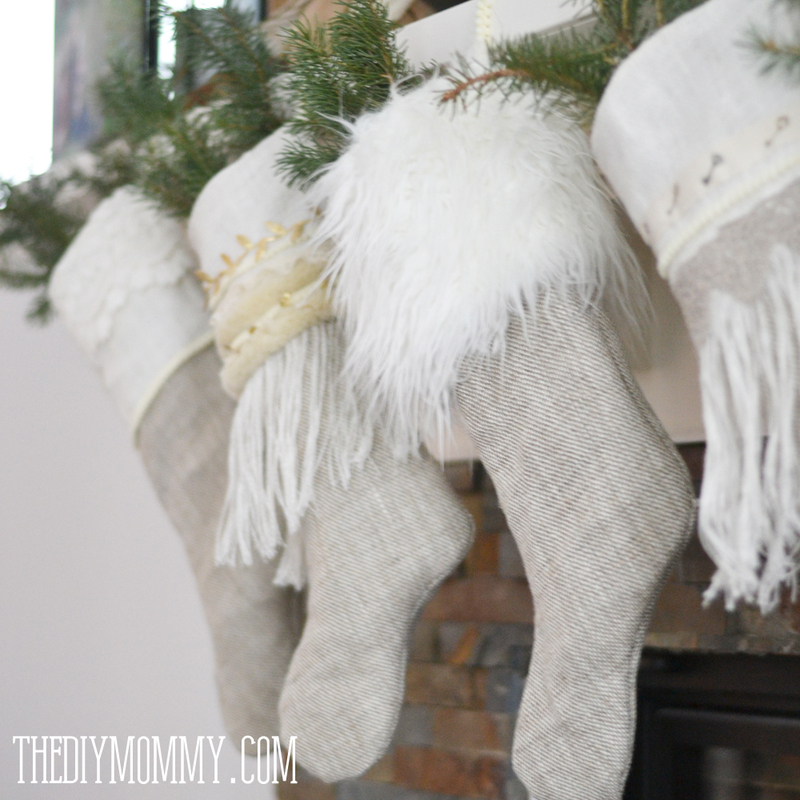 I had a blast making these, and I really love how they look on our mantel! 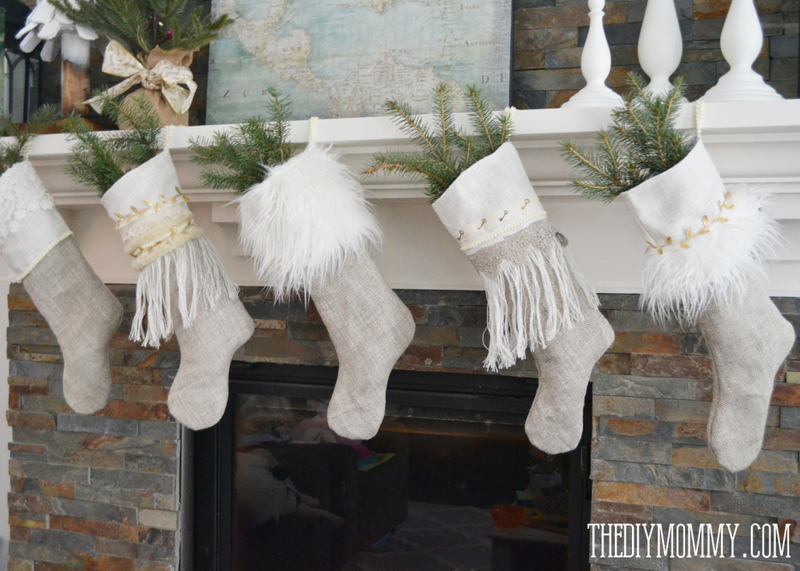 I’ll be sharing our Christmas mantel on Monday during the Canadian Bloggers Christmas Home Tour – I hope you stop by for that! Which stocking is your favourite? Thank you, OnlineFabricStore.net, for providing me with the lovely fabric for this project! 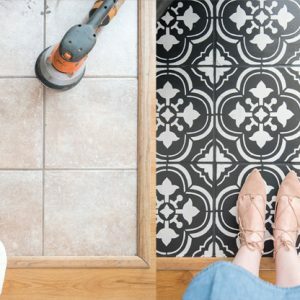 Never miss a post from The DIY Mommy again! Great stockings! I love the fur one, but the thick lace I think is my fav, I’m a sucker for lace! Help! Im making the stockings now. You have the cuff with 2 lining pieces and two main fabric pieces. I don’t see how to do this. Can you be more specific on how to sew the cuff? Do you only sew the sides and not the top and bottom before putting inside the main piece? Hi, Susan! It depends which version you’re making. If you’re making the fringed ones, just cut out one cuff for each stocking as per the directions (no lining). If you’re making another version – like the one with the fur cuff or lace cuff – you could cut the cuff out of cuff fabric and lining. Then, sew each at the side seams, and then sew the cuff lining to the cuff fabric piece right sides together on one long side. Turn the cuff right side out, and then insert it into the stocking and continue on as per directions. I hope that helps! If I want to make the cuff with out the trim can I cut the cuff on the fold of the fabric? If I do that i will put the cuff on differently ?? GORGEOUS stockings! I’m going to challenge myself to make them! 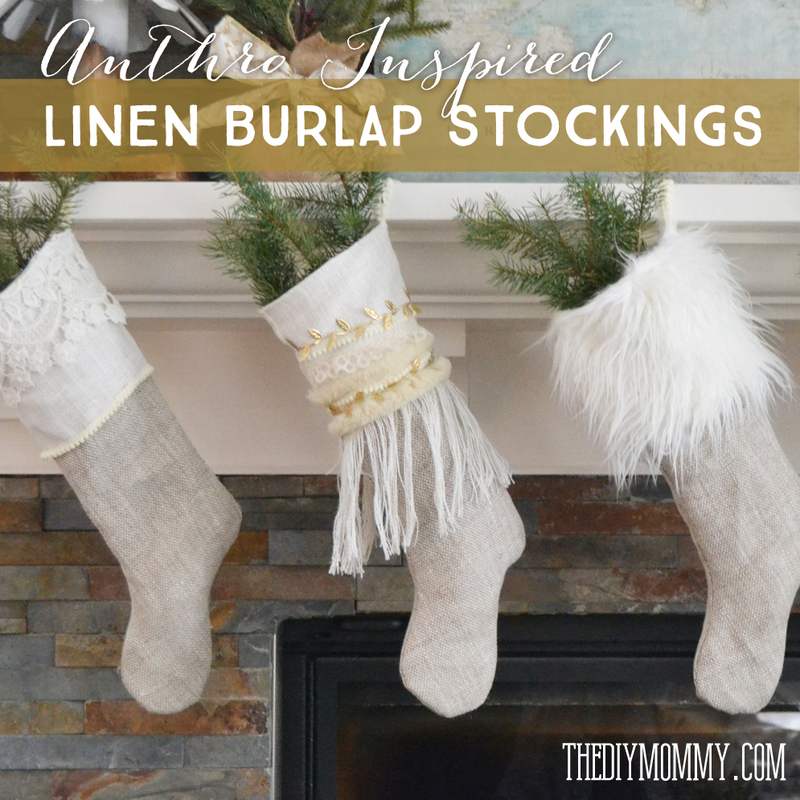 One question – is the three yards of fabric in the list of required things sufficient to make the *five* stockings or ?.. 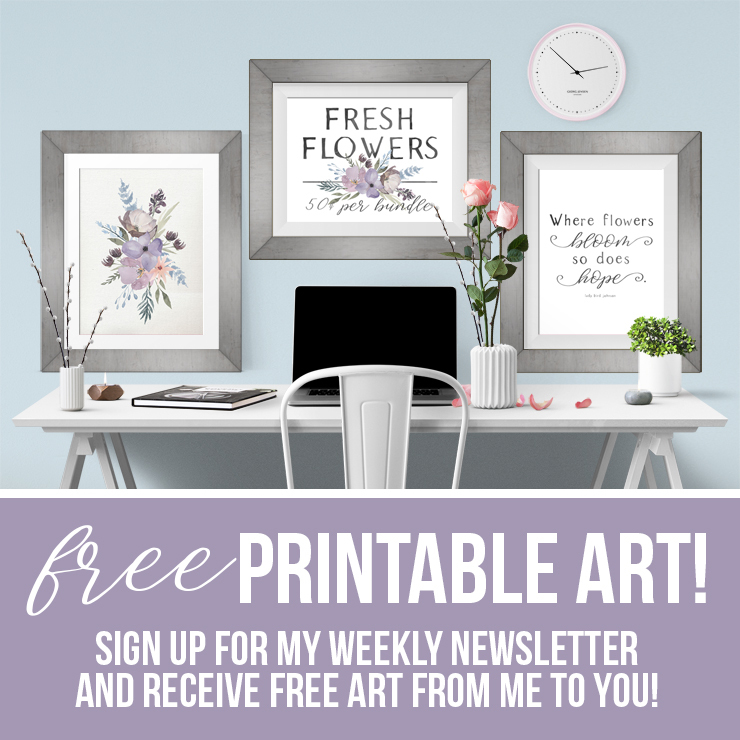 Subscribe to our email list to get your free floral art, free e-book and weekly DIY inspiration! How to Hem a Maxi Skirt or Dress – No Sewing Required! 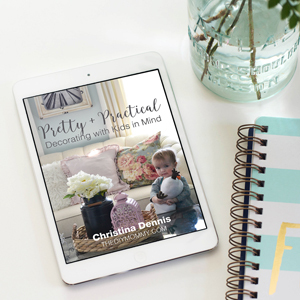 "The DIY Mommy" is a registered trademark belonging to Christina Dennis. 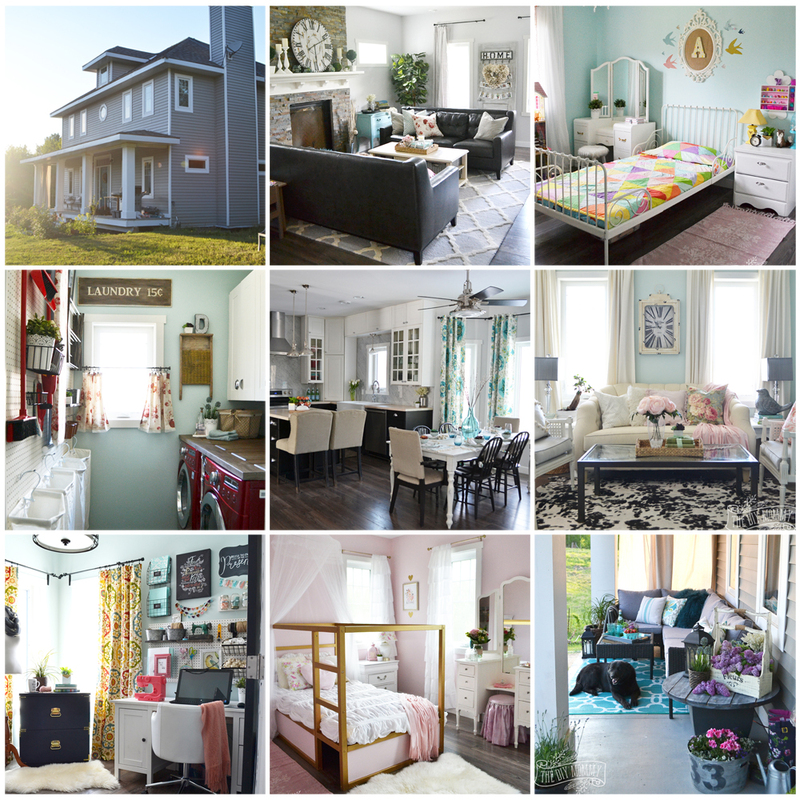 Disclaimer: While every effort has been made to ensure the accuracy & effectiveness of the information displayed on this website, The DIY Mommy makes no guarantee as to the procedures & information contained here. 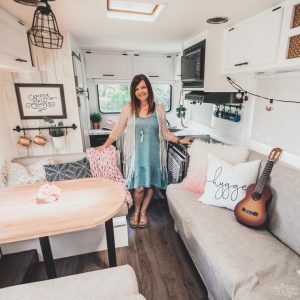 The publisher will not be liable for direct, indirect, incidental, or consequential damages in connection with or arising from the use of the information displayed on thediymommy.com. This website is not intented to substitute the advice of a professional. Note: Posts may contain affiliate links or sponsored content. For more of our disclosure policy, click here.